Upgrade your spring wardrobe with this twist on a windowpane. Featuring a micro-windowpane in seasonal colors, this mid-weight twill may seem ordinary at first. Take a second look and you’ll find slubbed threads that make up the warp and weft - each a different color. The unique blue warp and orange weft create a subtle visual texture in this perfect warm weather style. Fabric: 100% Cotton, sourced from luxury Czech mill Mileta. Fit: Available in classic and tailored fit. Gentle machine or hand wash in cold water only. Hang or lay flat to dry, as machine drying can cause shrinkage. Remove collar stays before laundering. 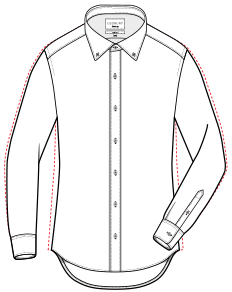 Avoid excessive heat and use little to no starch to prolong the life of the shirt.